Our dog friendly, Exmoor self catering, holiday cottages at West Withy Farm. Exmoor National Park – Partner. 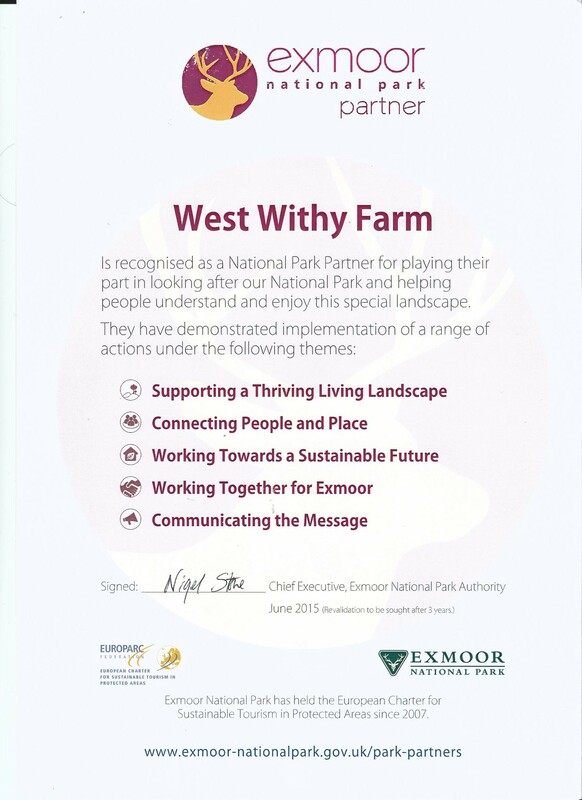 In June 2015, West Withy Farm was made an Exmoor National Park – Partner. You can view our certificate here. Our dog friendly, self catering, holiday cottages. There are two dog friendly, self catering, holiday cottages at West Withy Farm, each converted from 18th century farm buildings with very generous, enclosed, dog friendly gardens. Upton Cottage – sleeps 5 in three bedrooms – one double with en-suite loo, one twin and one single bedrooms plus cot. Stable Cottage – sleeps 4 in two bedrooms – one queen and one twin singles bedrooms plus cot. In origin, our cottages are farm buildings with 50+cm thick, solid stone walls and huge roof beams. integrated kitchens including dishwasher and washing machine under granite worktop. new bathrooms with free standing shower and separate bath. Our cottages are maintained to a high standard and we take particular pride in our linens and our cottage cleanliness. Which dog friendly, self catering, holiday cottage would be perfect for your holiday?